Sample OEF Assessment Feedback Report - See an example Feedback Report based on an organizational assessment conducted using the OEF. See an example Feedback Report based on an organizational assessment conducted using the OEF. Download the Sample OEF Assessment Feedback Report by submitting the blue form below. 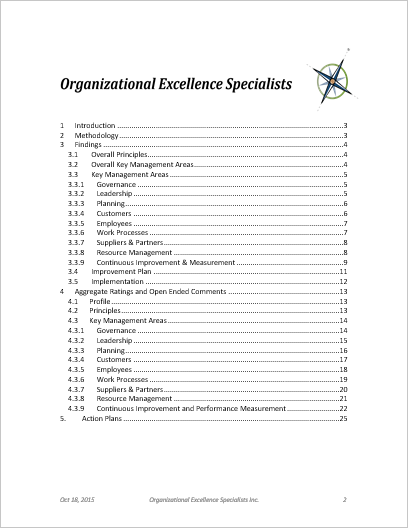 This is a 56-page sample of the Feedback Report (for SML organizations) developed by Organizational Excellence Specialists. This report provides a deeper examination of an organization, and provides detailed action plans to help address opportunities for improvement. This assessment is performed based on the Organizational Excellence Framework (OEF). Download the Sample OEF Assessment Feedback Report now!